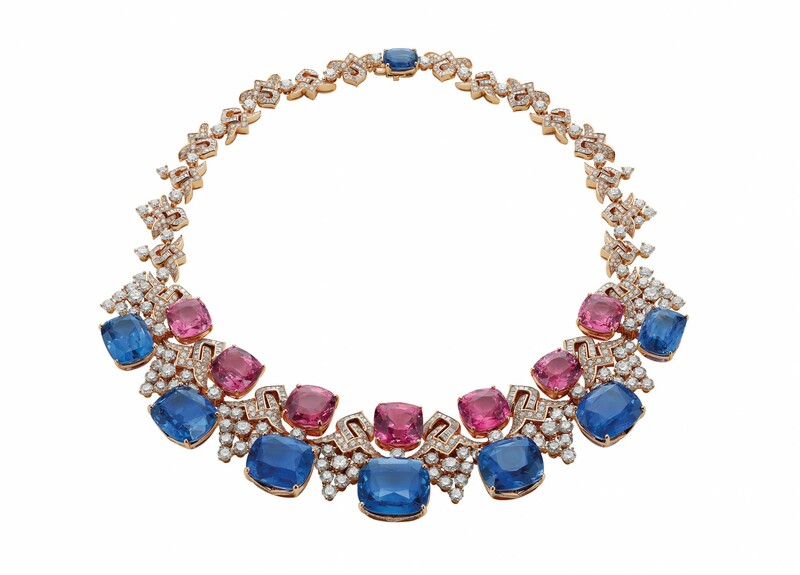 The Bvlgari necklace contains a tight, geometric pattern made of 18K gold and paved with diamonds and rare blue sapphires. 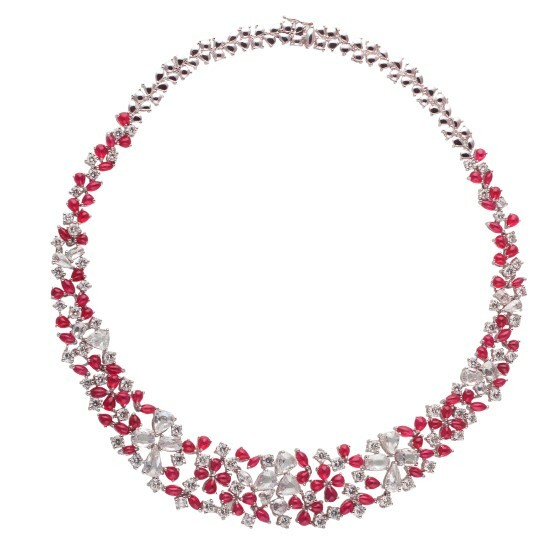 Special cut calibre rubies are draped with uncut diamonds and pearls in this contemporary Estaa necklace. It is crafted in 22K gold. 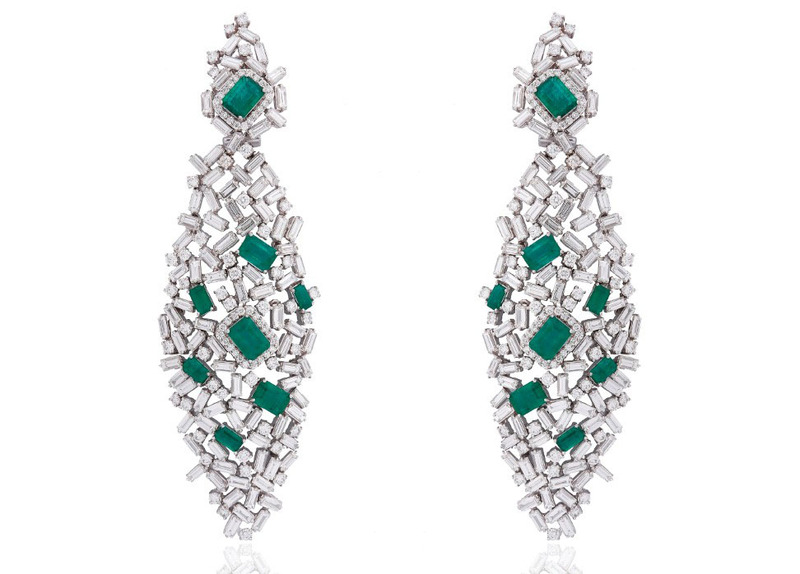 These fine Aurelle earrings are made in white gold with round and baguette diamonds, topped with green emeralds. 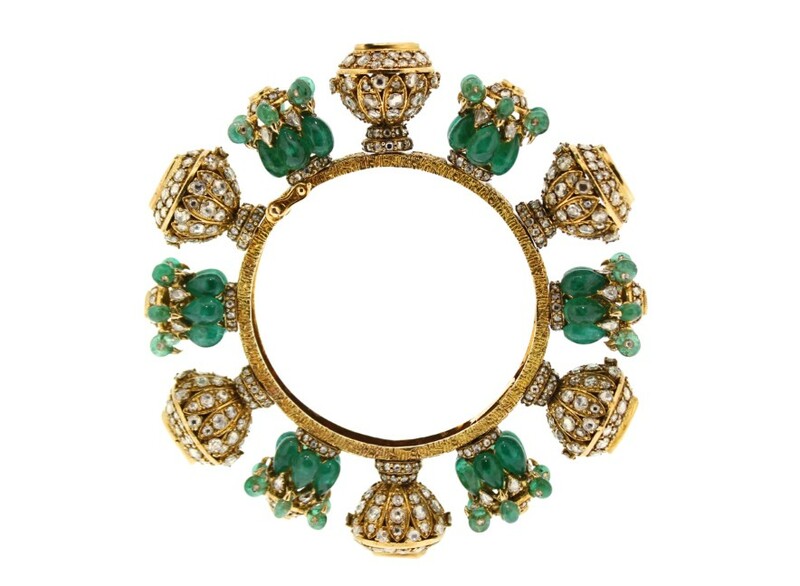 This bangle from Birdhichand Ghanshyamdas Jewellers is set in gold and embellished with diamonds. 19 Sri Lankan cabochon sapphires are set into yellow gold elements rimmed with diamonds, on this exquisite Buccellati neckpiece. 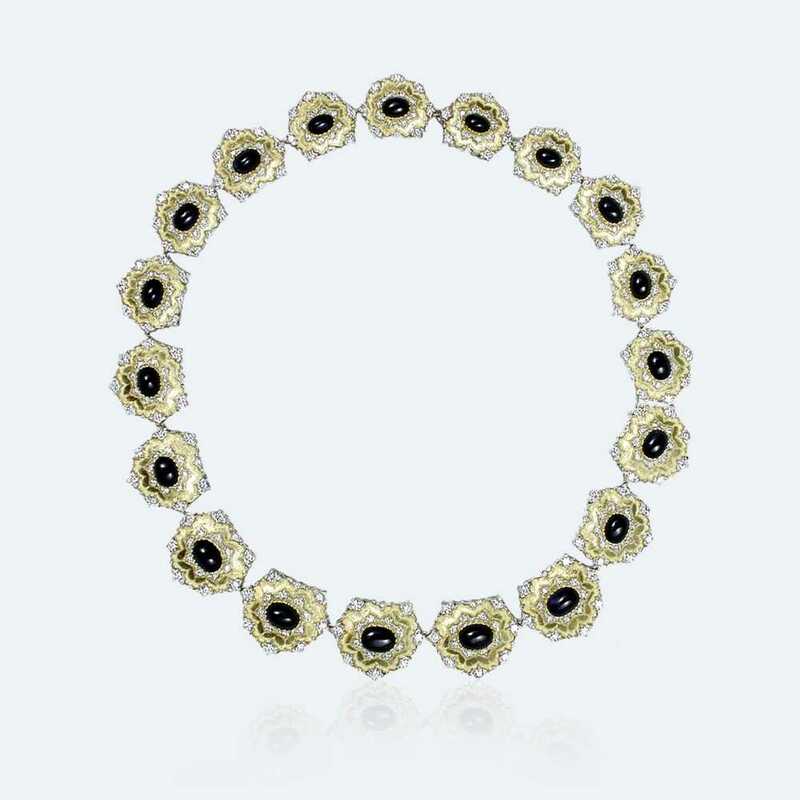 Crafted in 18K white and rose gold, this Bvlgari necklace comprises of 16 round brilliant cut diamonds and pavé diamonds. 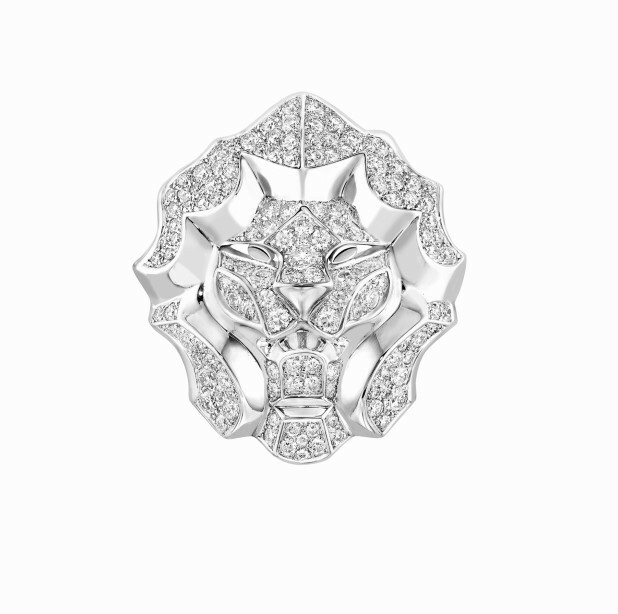 This Chanel Lion Pépite ring in 18K white gold is set with 130 brilliant-cut diamonds. This Nirav Modi Flamingo Embrace Bangle is crafted from deep pink sapphires toning out to white diamonds. 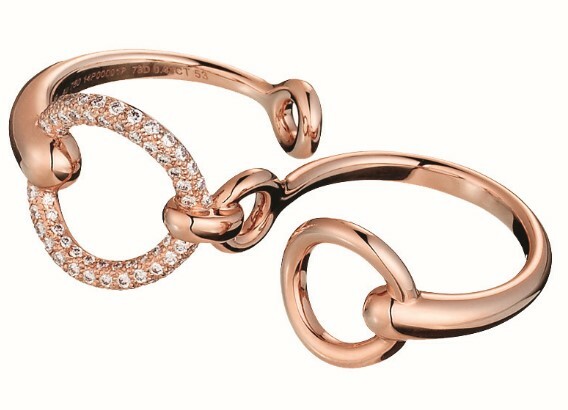 These stones are mounted in 18K rose gold. 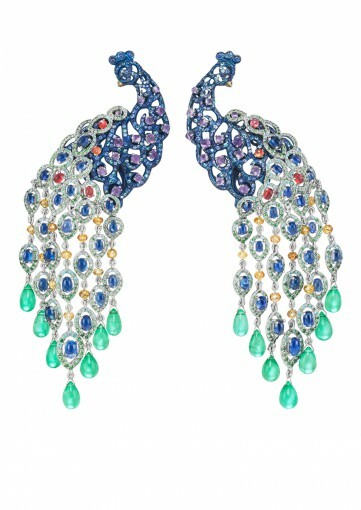 Set in 18K white gold titanium, these peacock Chopard earrings comprise of emeralds, tsavorites and sapphires. 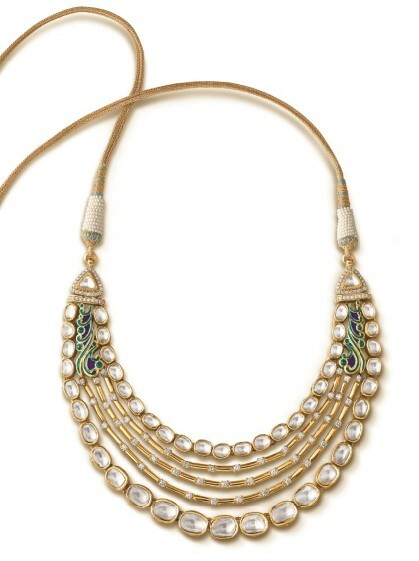 This jadau necklace from Diagold is a fine combination of delicate green mina and polki of the Shahi era along with golden south sea pearl strings. 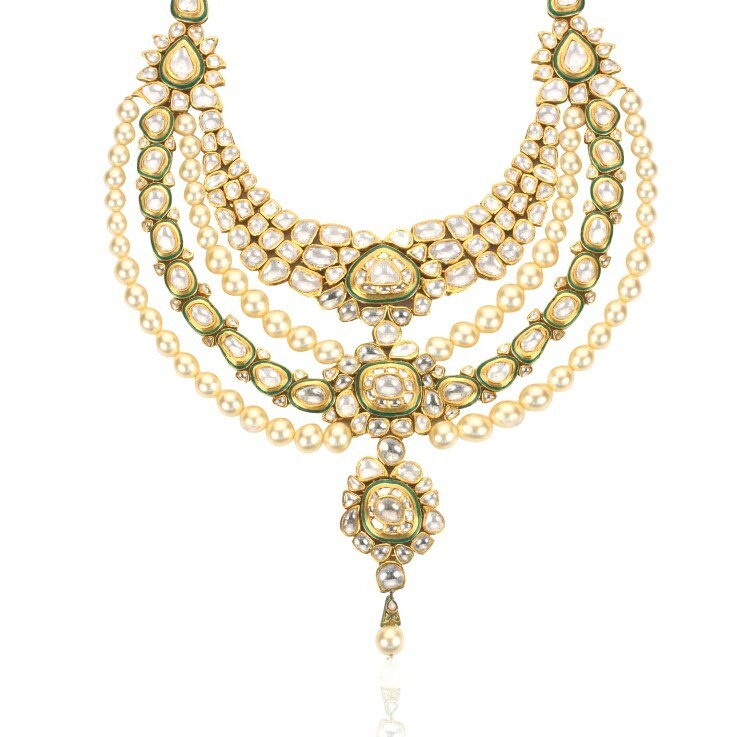 Crafted in 18K gold, this neckpiece from Anmol Jewellers is set with emeralds, pearls, uncut diamonds, yellow diamonds and round brilliant diamonds. 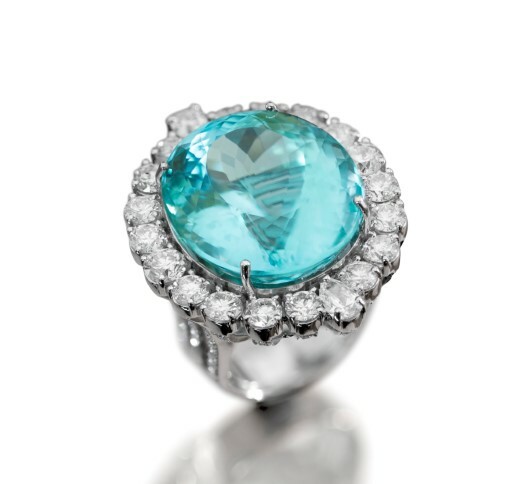 This columbian emerald ring from Farah Khan Fine Jewellery is surrounded with diamonds set in 18K white gold. 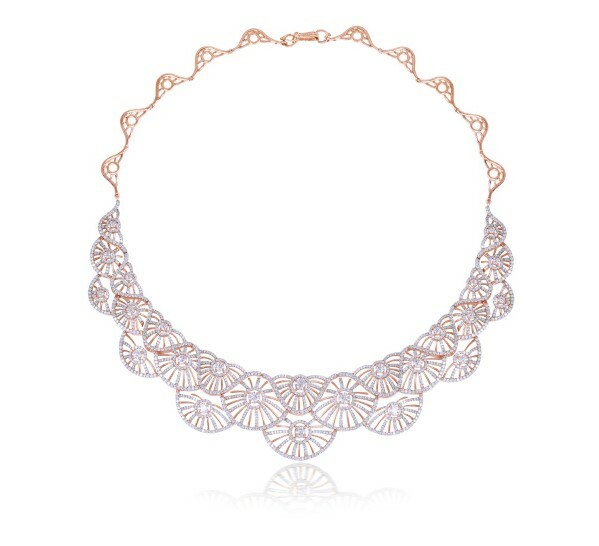 Forevermark’s dainty necklace contains round cut diamonds set in rose gold. 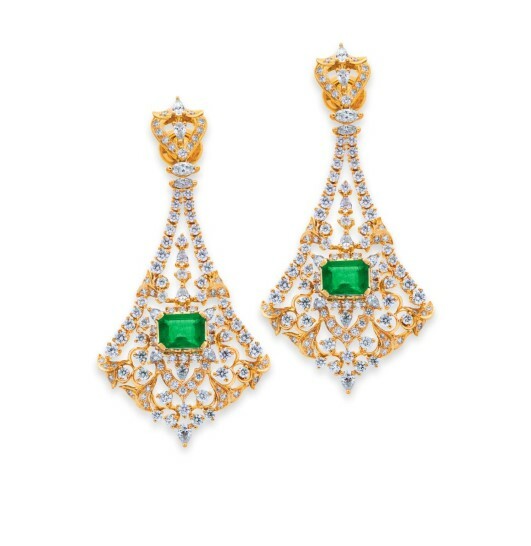 Engraved in 18K gold with rich Zambian Emeralds, these Ganjam earrings are inspired by Moorish architecture. 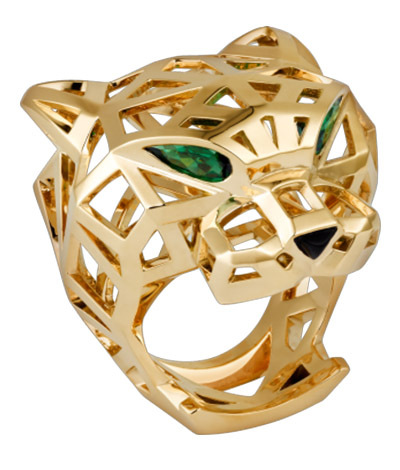 Cartier’s emblematic panther is crafted in yellow gold with tsavorite garnets and onyx. A combination of yellow and white diamonds, these earrings from Gehna Jewellers are part of the KJo for Gehna collection. 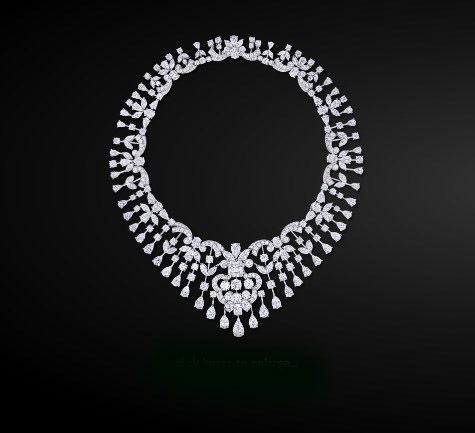 This baroque inspired necklace from Graff Diamonds contains 370 of the finest white diamonds. 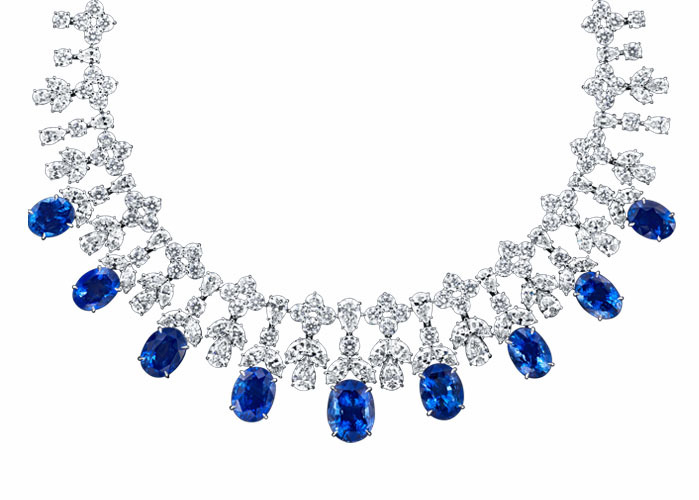 This Harry Winston neckpiece contains 9 oval sapphires, with 216 marquise, pear-shaped and round brilliant diamonds. This intricately designed gold and diamond embellished set from Hazoorilal Jewellers South Extension is elaborate and a sure must-have. 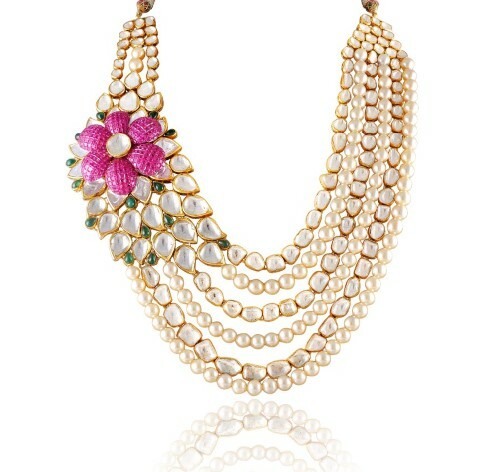 Handcrafted in 22K gold, this polki necklace from Jaipur Gems can be passed down to generations. 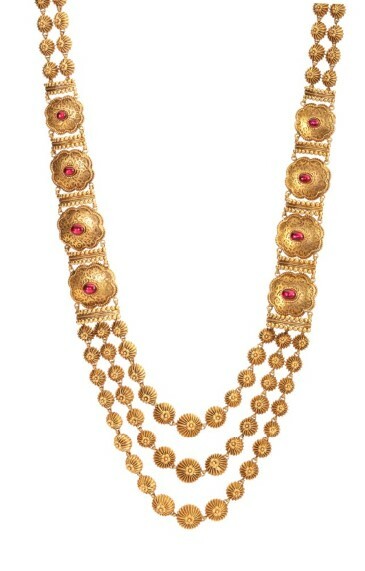 Rare taveez-shaped spinal rubies are intricately woven in a rope of fine basra pearls from Jaipur Jewels. Especially sourced, the antique pocket watch in fine pink French enamel dates back to 1790. 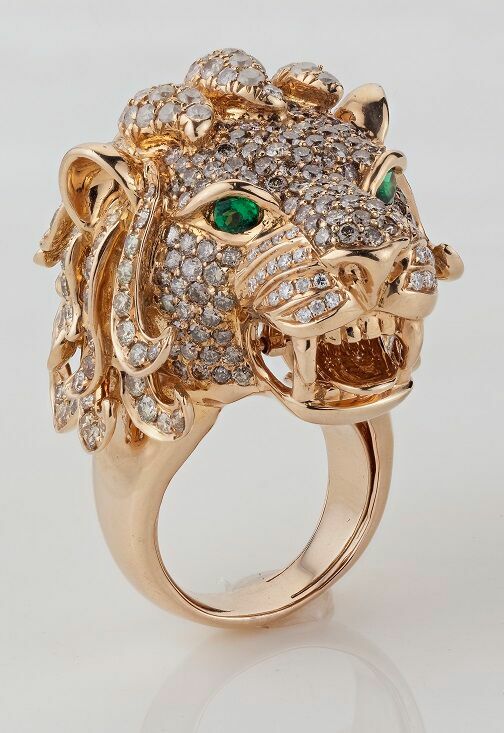 This lion ring made in rose gold is part of the Timeless Stunners collection from Khanna Jewellers. 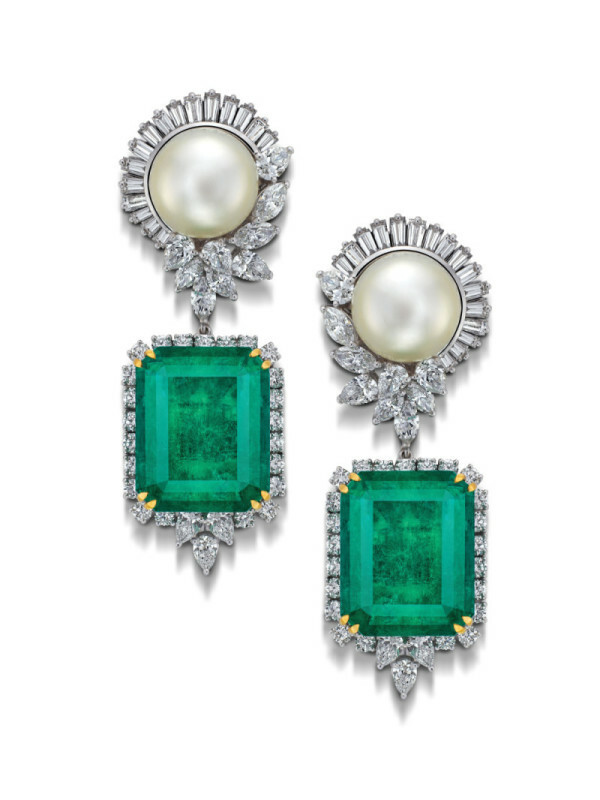 These House of Rose earrings have been crafted with faceted, emerald-cut Colombian emeralds encased in diamonds and gracefully suspended from South Sea pearls nestled in a bezel of baguette-cut and pear-shaped diamonds, set in 18K white gold. 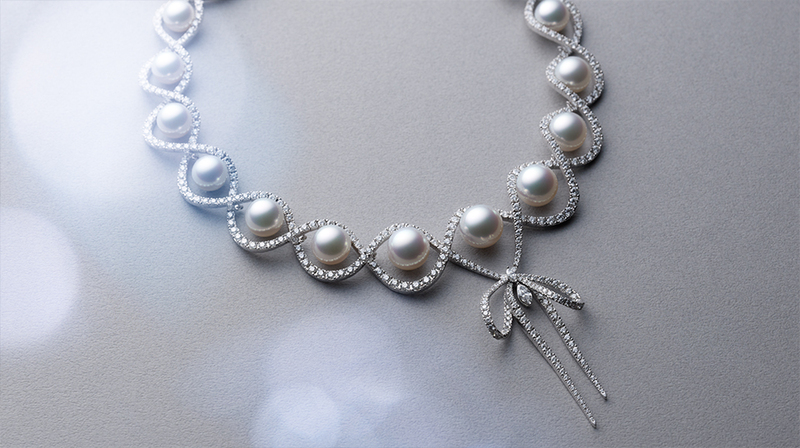 Crafted in 18K white gold, this necklace from Mikimoto contains silver lip pearls and diamonds. 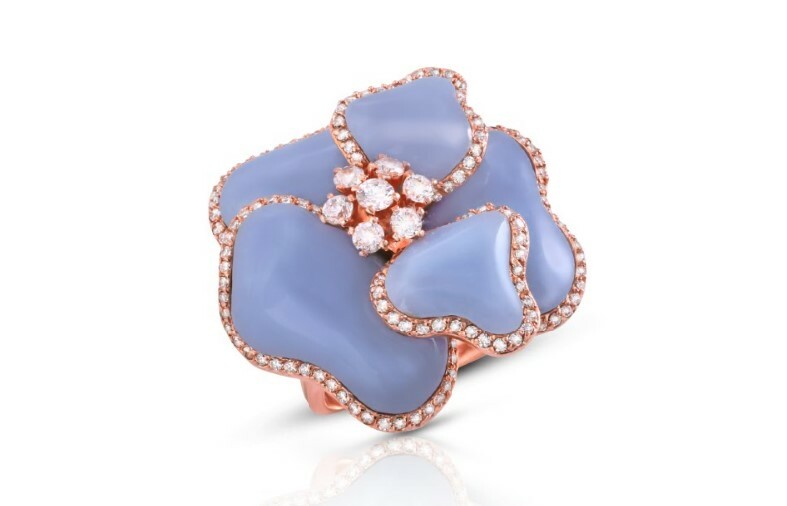 This Minawala ring has been crafted in pink gold, diamonds and chalcedony. 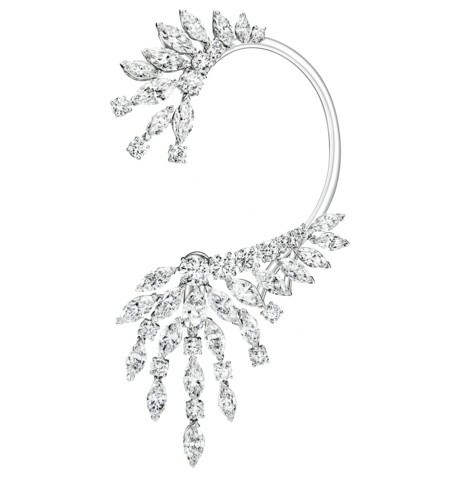 This Mirari necklace is handcrafted in 18K white gold. 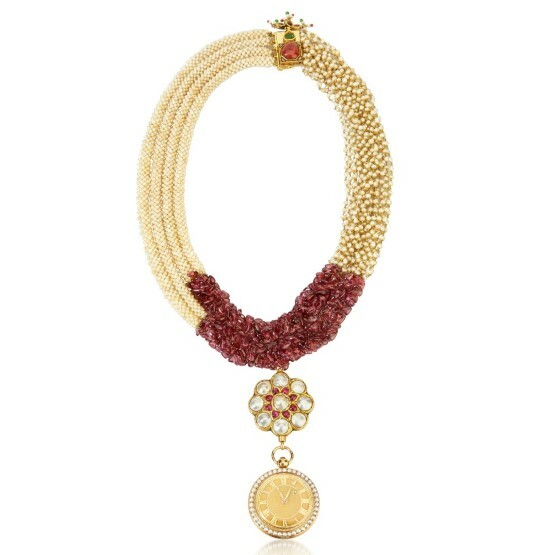 It’s a unique combination of brilliant and old cut diamonds with intense Burmese rubies. 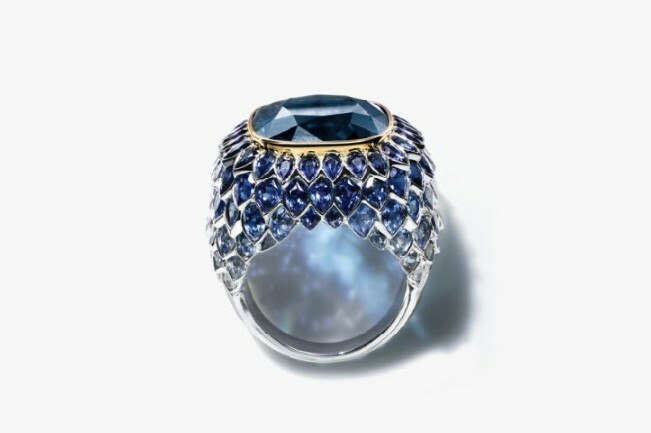 This platinum and 18 K gold ring from Tiffany & Co. features a 14.98 carat cushion cut blue tourmaline embraced by sapphire and diamond scales. 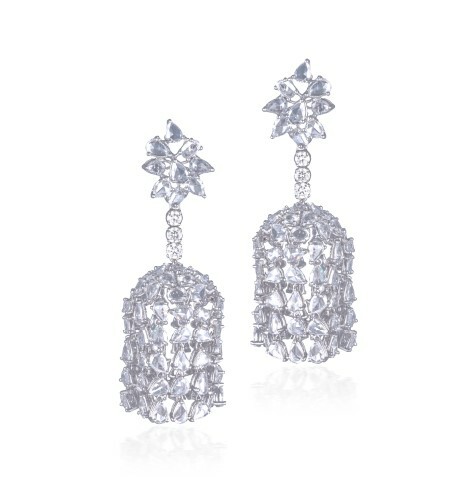 These Piaget earrings are set in 18K white gold with 28 marquise-cut diamonds and 20 brilliant cut diamonds. 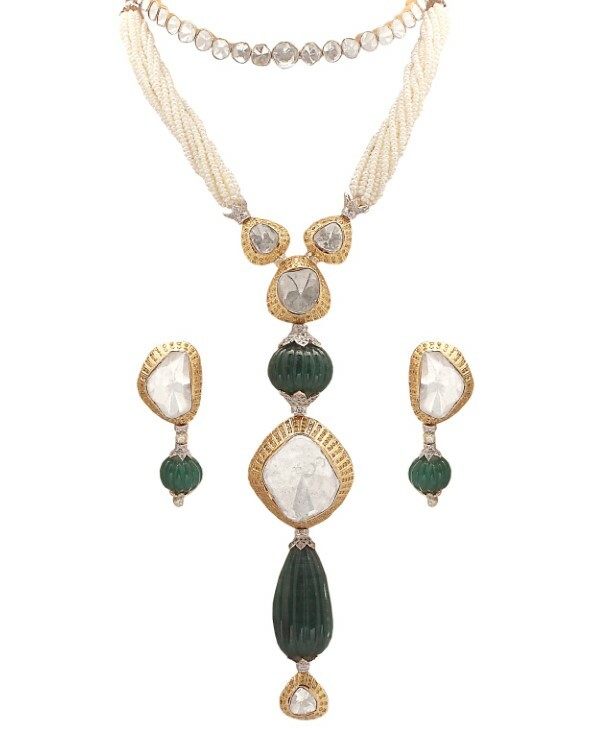 This Poonam Soni necklace is set with platinum coins, chrysoberyls and diamonds. 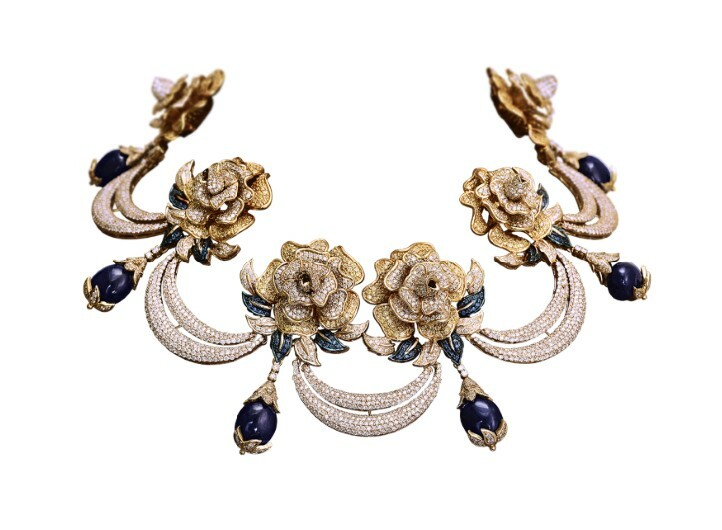 Inspired by nature, this Rare Heritage neckpiece is set in 18K gold and studded with yellow and blue sapphires and diamonds. Comprising of different shaped diamonds and the rosecut diamonds, these Renu Oberoi jhumkas are inspired from the Mughal Era. 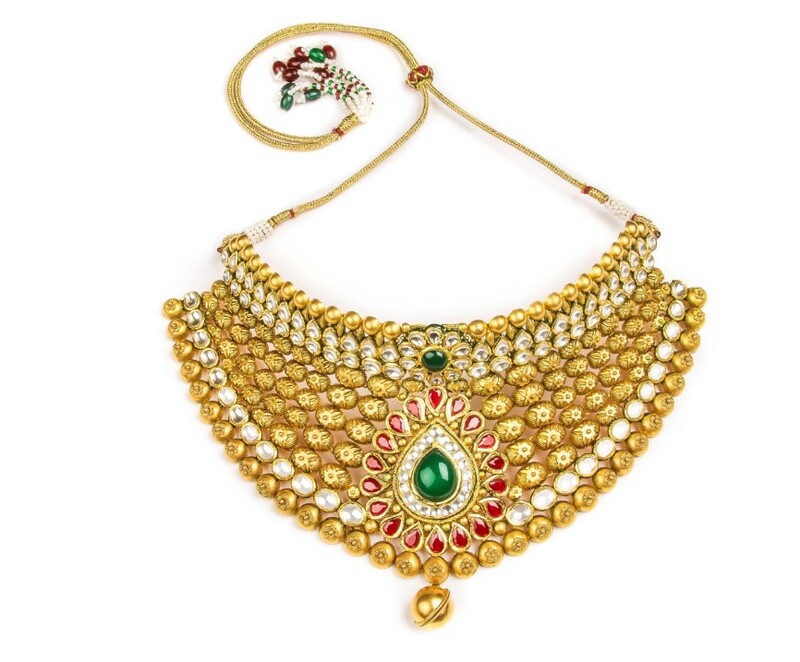 The Mughal polki bridal necklace from R K Jewellers is completely handcrafted and set in 22K yellow gold. It comprises of precious uncut, colourless diamond polkis. 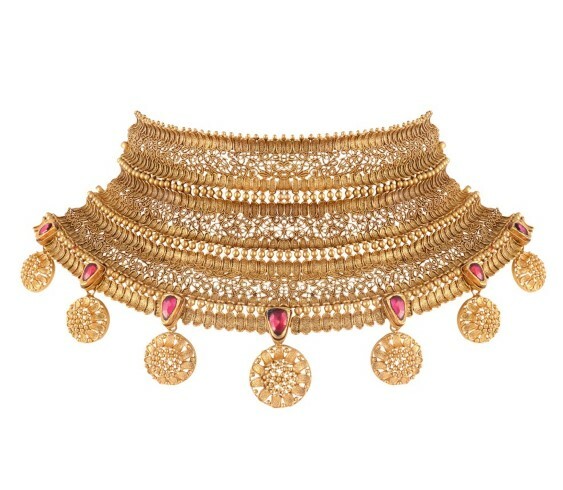 This tribal-inspired choker from Sunar Jewellers comprises of dangling gold coins and is crafted entirely in gold. 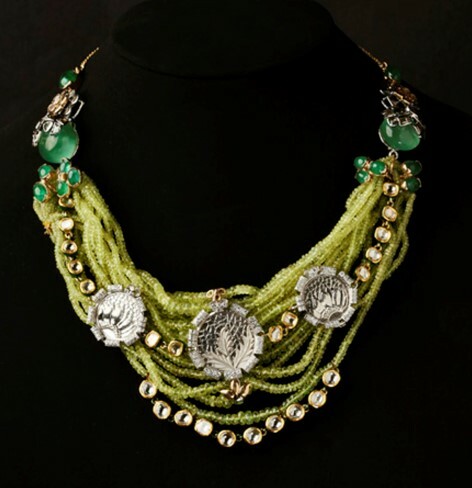 Inspired from the the ornate ceilings of Ranakpur Tirth, this Tanishq necklace comprises of a 3 string haram with melon shaped gold beads. 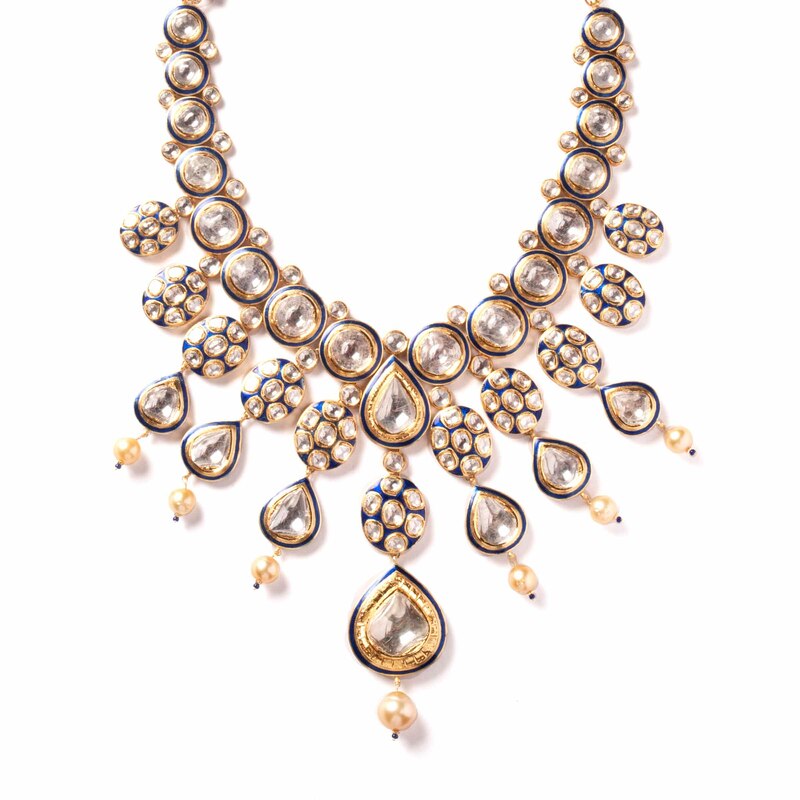 Crafted in gold and set with Pears, marquis and round brilliant diamonds, this TBZ necklace is inspired from floral designs. 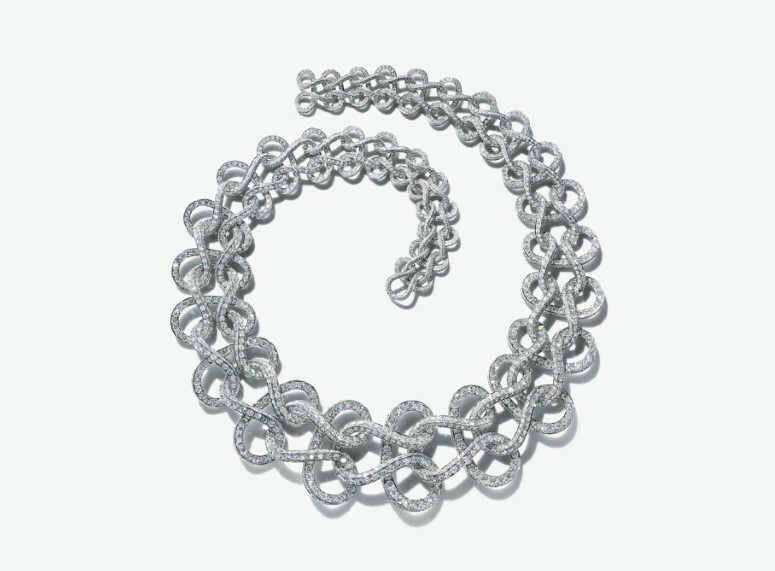 Inspired by an archival design from the 19th century, this Tiffany & Co. platinum necklace was set by hand with hundreds of diamonds. 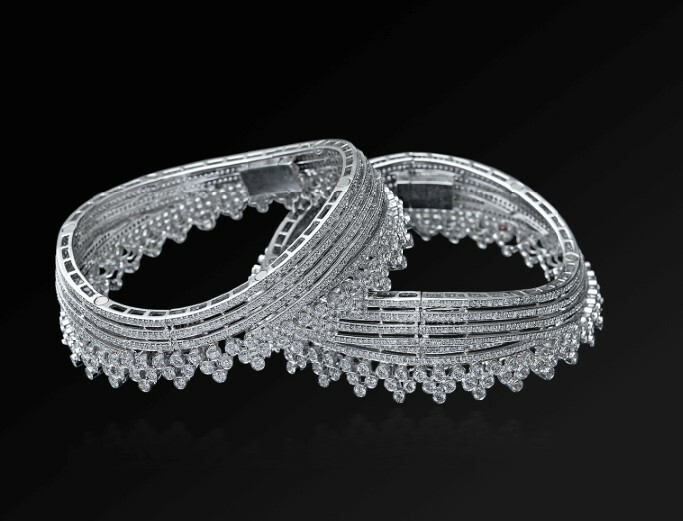 These diamond studded bangles from Varuna D Jani are part of her Vows That Bind collection. 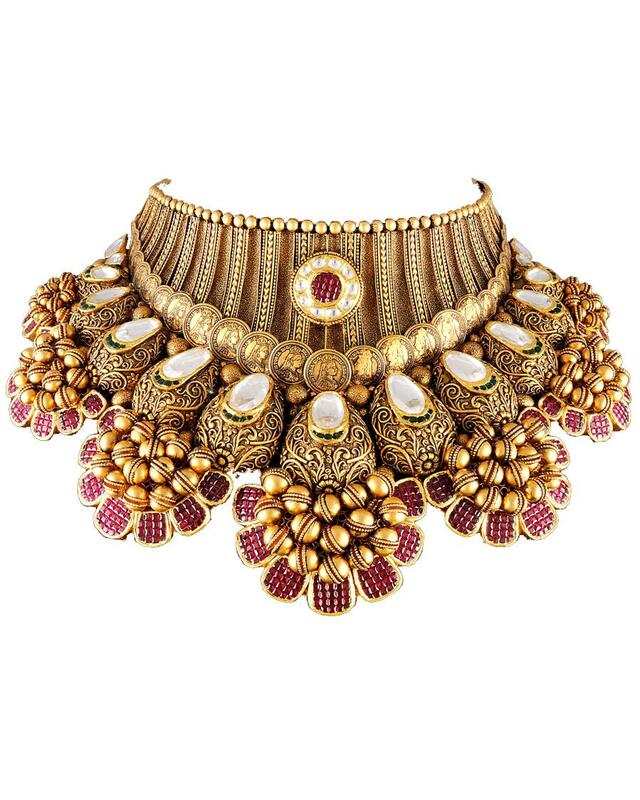 This intricately designed choker from Vikas Chain and Jewellery is part of their Royal Collection crafted entirely in gold. 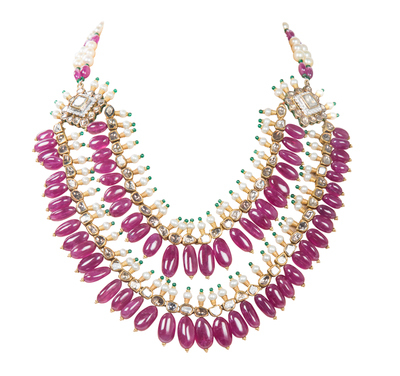 This Zoya necklace is inspired by the Chiankari embroidery of the Awadh Era. 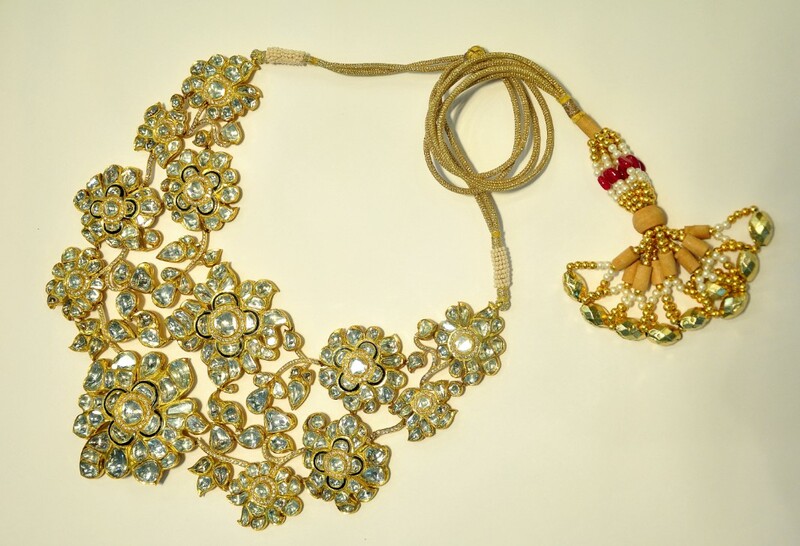 It is set in 22K with strings of polki and gold interspersed with diamonds. 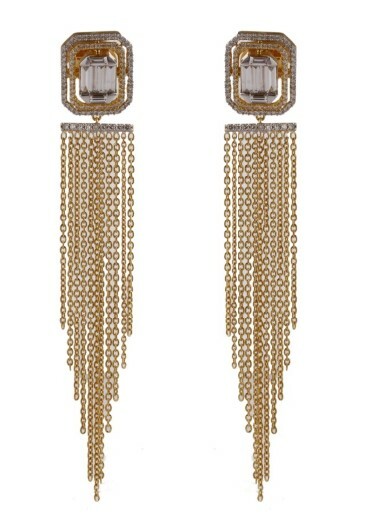 The Filet D’or collection from Hermes is crafted in rose gold and diamonds. 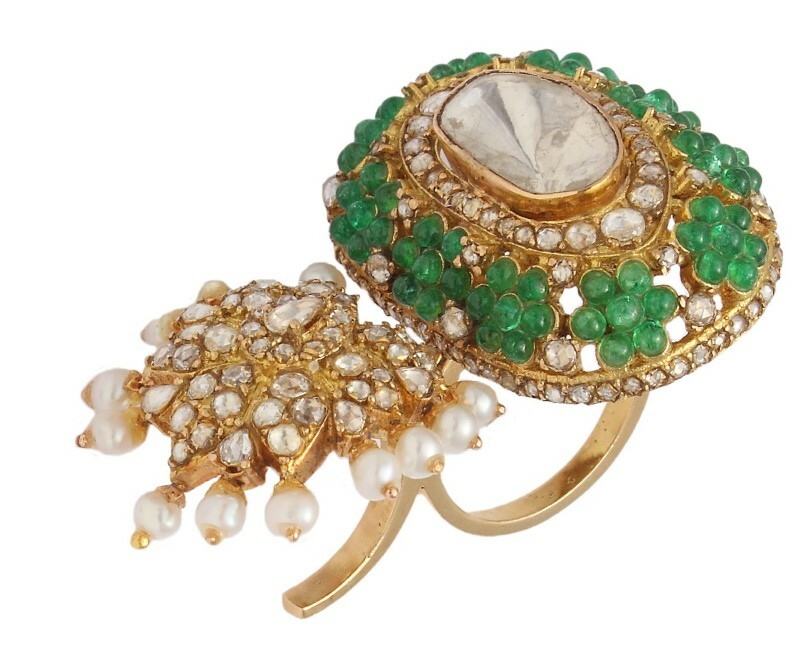 This ring by Anmol Jewellers is crafted in 18K gold and set with emeralds, pearls, uncut diamonds and rose cut diamonds. 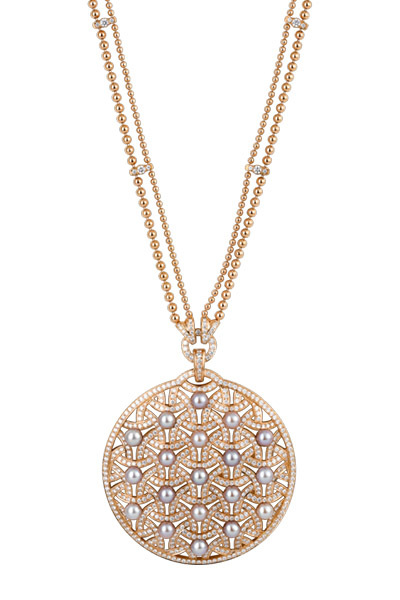 The Cartier necklace is set in 18K pink gold, with 19 cultured freshwater pearls and 676 brilliant-cut diamonds. 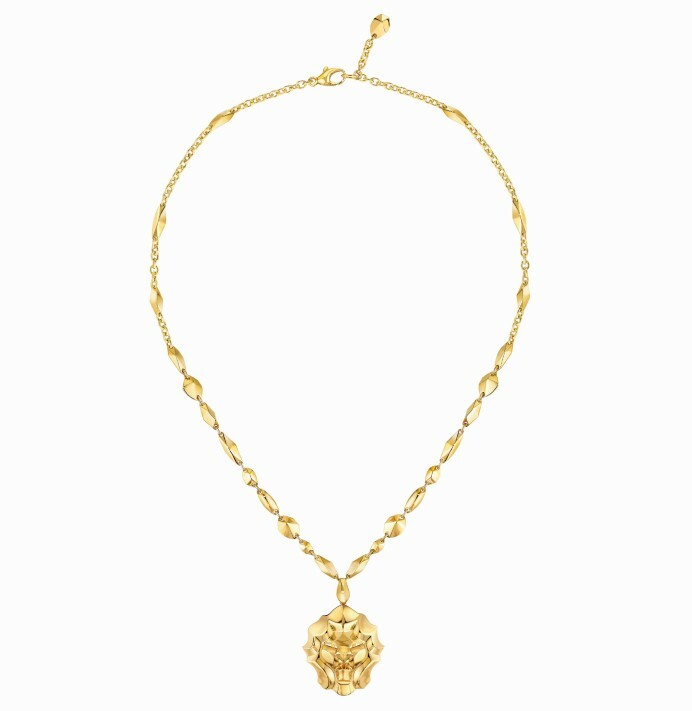 The Chanel Lion Pépite necklace is set in 18K yellow gold. 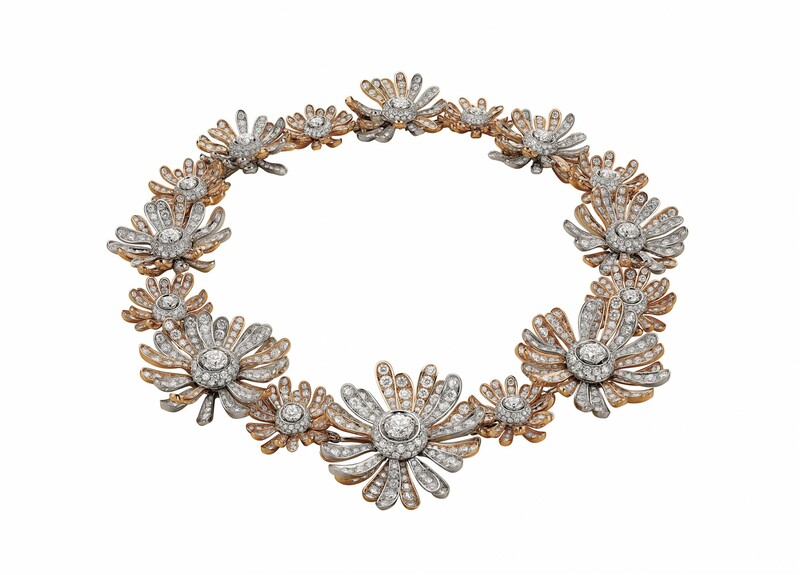 The Palme Verte collection is Chopard’s first diffusion jewellery collection in ethical gold. This chain is crafted in Fairmined 18K yellow gold. 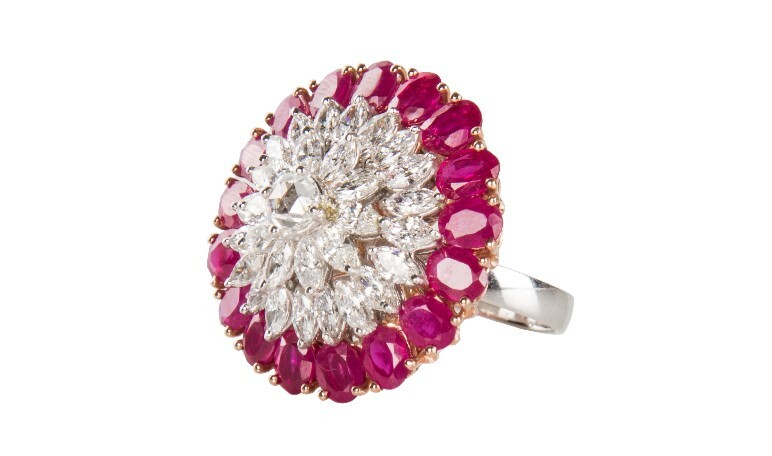 Marquise diamonds and rubies along with a rose cut solitaire make up this beautiful ring from Estaa. 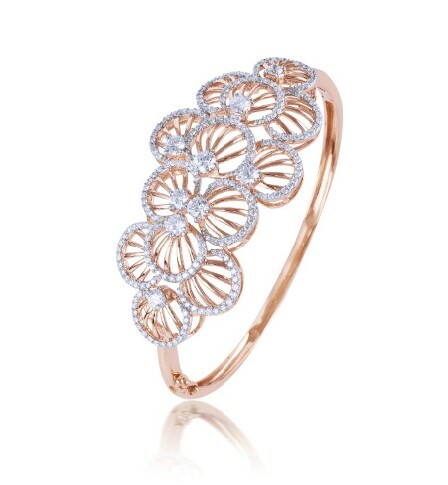 This Forevermark bracelet comprises of round cut diamonds set in rose gold. 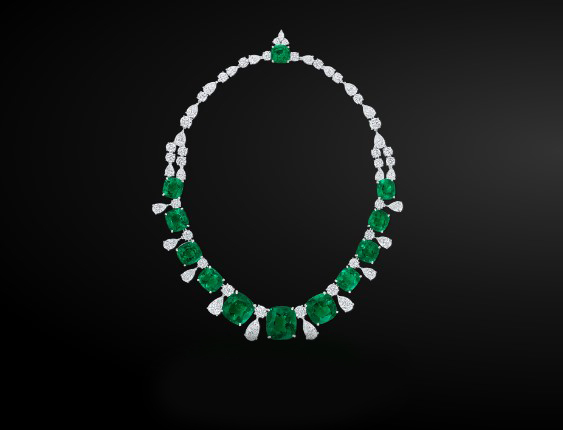 This necklace by Graff Diamonds contains the finest Columbian emeralds and diamonds. 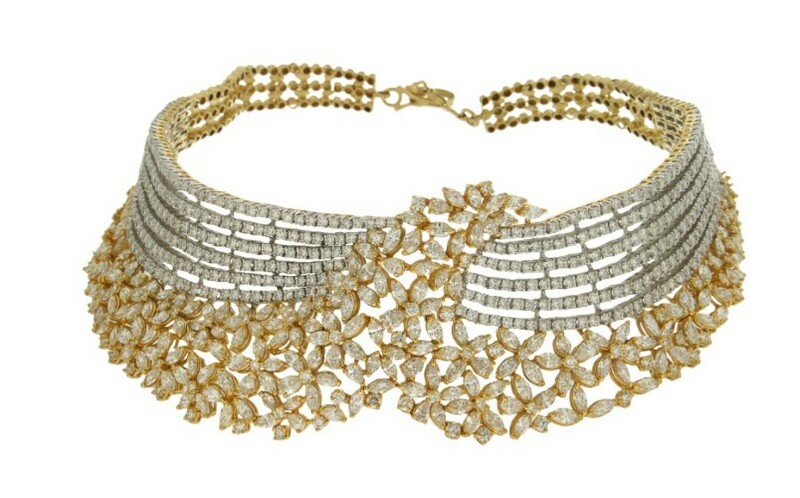 This choker by Manubhai Jewellers is set in 22K gold with traditional chitrayi work and kundan karigari. 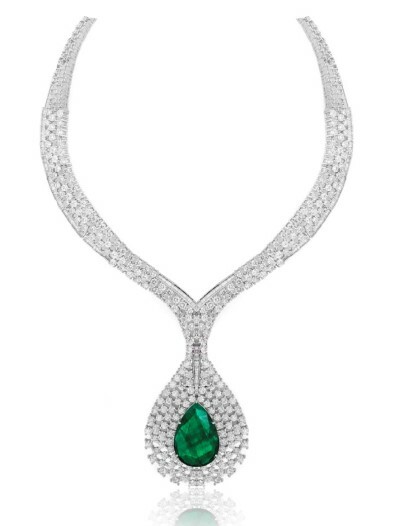 This Minawala necklace is set in 18K white gold with diamonds and emeralds. 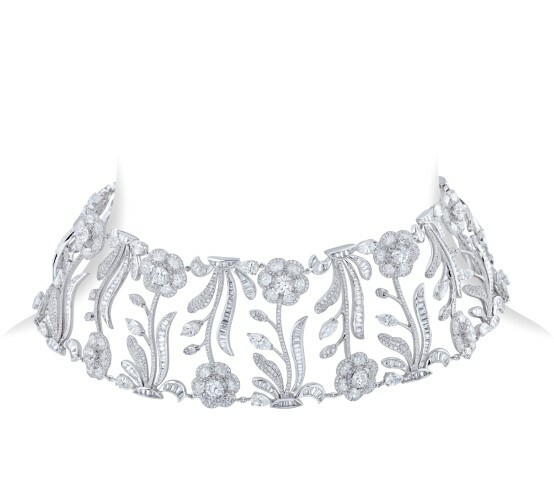 Nirav Modi Mughal Flower Choker contains diamonds set in 18K white gold. 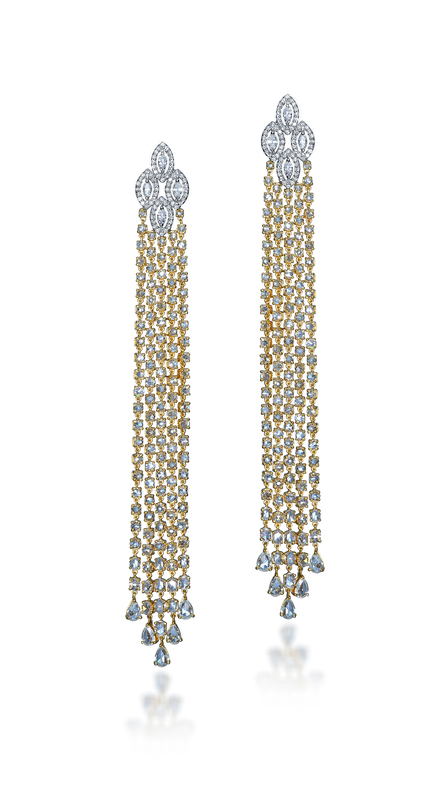 This pair of modern earrings from TBZ includes a set of baguette diamonds surrounded by round brilliant diamonds in emerald, followed by the gold chain tassels. 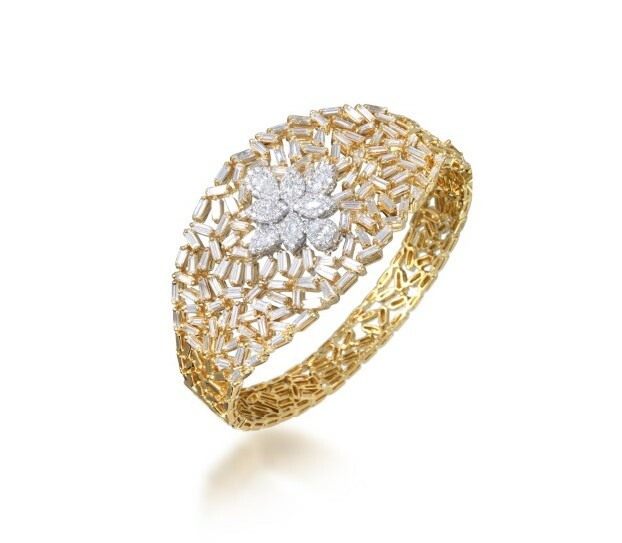 The cuff from Gehna Jewellers is a beautiful amalgamation of round diamonds and baguettes. 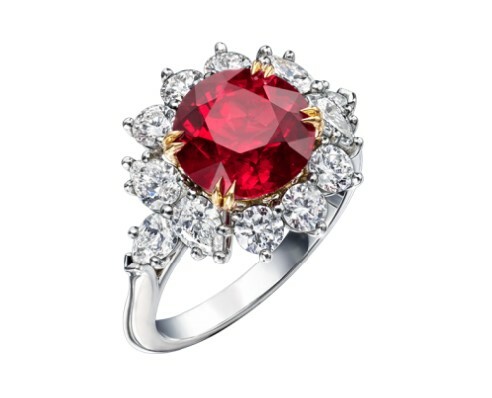 This Harry Winston ring comprises of a round brilliant ruby, with 12 pear-shaped and round brilliant diamonds, set in platinum and 18K yellow gold.